Under the flame of several Rock N’ Roll guest artists like Ozzy Osbourne from Black Sabbath, Ace Freshy from Kiss, Nita from Alice Cooper, made that album unique as hell!! Read More: All heil to Megadeth!! what leads to be a great musician like him!! His music is going to heavier day by day what made him to strongly believe that’s happening because of his inner anger!! U ROCK MAN…. 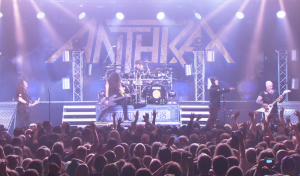 Anthrax’s upcoming deluxe edition of their mighty album States of Euphoria on next October for its 30 years celebration gonna be another masterpiece for their glorious musical career as well!! Even the new generation is adding up continuously!! I hope they will consider them not only as an entertainer but an ‘Artist’ at first!! Like everybody knows that he vocal is suitable of Classic Rock, for his high tenor. Read More: Metal is a passion….